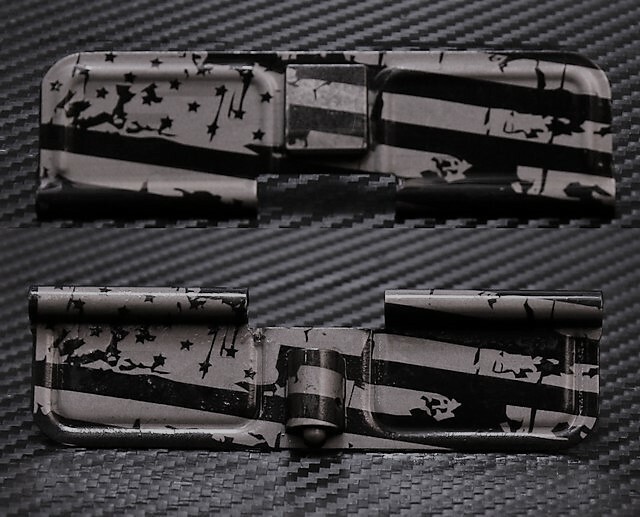 Our engraved AR ejection port dust covers are second to none, and we are continuing in our quality tradition by introducing the Distressed US Flag full panel engraved ejection port doors that show off your patriotism for our great country . Our graphic design team is getting busy and creating some of the best looking AR-15 dust covers available. These designs are sure to turn heads and turn the clunky old dust cover into a work of art on your rifle. These AR15 ejection port covers are engraved with an industrial laser that oxides the coating to create a permanent, rust proof, bright and shiny image on your rifle. Don't settle for the inferior covers that look dull and tarnished, get the real deal here. Perfect for showing off your new rifle, or rekindling some love for an older one. These covers are sure to start conversations at the range every time you pull your AR out. High quality laser etching. Will buy more. Top quality dust cover with perfect tack sharp laser etching. Will be buying the two sided 2nd Amendment cover for my next build. This was my first time building an AR-15 from scratch and I wanted to customize it with cerakote parts. I’m extremely impressed with the detail of the engraving on this dust cover and the quality of the coating. I will be buying from you all again when I build another! Q: Is it possible to have distressed American flag inside and outside with name engraved inside? Thanks. A: Yes, that would be possible, you would want to place an order for a custom dust cover and then specify what you want.